They stand 21½ – 27½ inches tall and have a wingspan of about 38 inches. Their long, down-curved bill is pink-brown to black in color and is used to probe the mud for food. Males are larger than females and weigh 1 lb. 6.5 oz while females weigh 1 lb. 5 oz. Mangrove swamps, muddy estuaries, and tidal flats. Northern Venezuela to Brazil, Central America, southern U.S., and a small area in Africa south of the Sahara. Fiddler crabs, aquatic insects, fish, snails, green algae and othersmall animals. Nesting usually takes place during the rainy season (May and June). The nest is constructed of loosely placed sticks that the male brings to the female. She will lay 2-3 dull olive-green to buff colored eggs and incubate them for 21 – 23 days. The nestlings begin to climb around in the trees when they are 2-3 weeks. They will be able to fly around 28 days. Their greatest danger is human disturbance at their nesting areas. Once disturbed they may leave the nesting area, therefore producing fewer chicks. The birds are also collected for their meat and feathers. This social bird can be found living in flocks that number up into the thirties. The flocks often include heron and other species of ibis. When startled, the birds will utter an alarm note and take off as a group. Other than this warning note, they are usually silent. 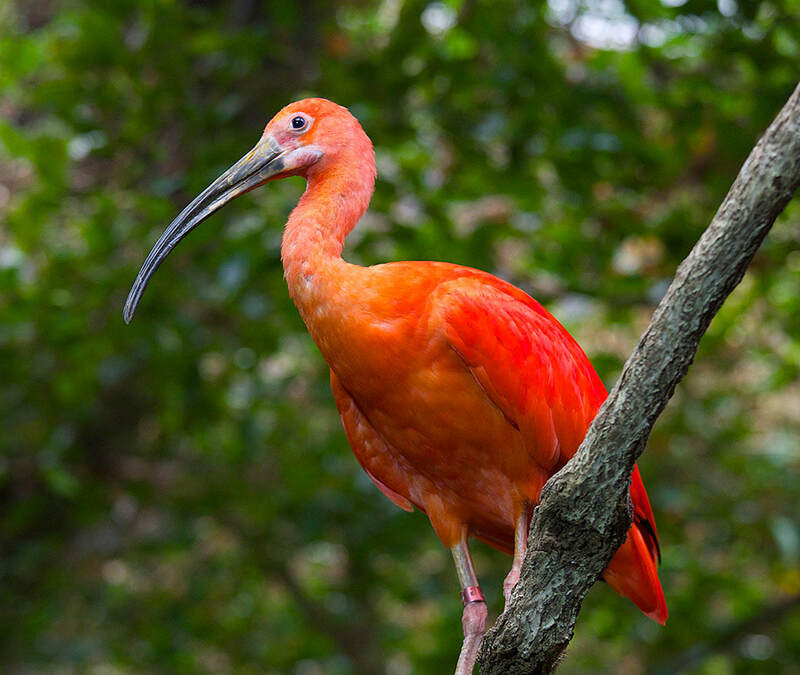 The bright pink-orange feathers get their color from the crustaceans the ibis eat. The Zoo’s ibis have a special diet that includes food items with this pigment. If the diet changes, the new feathers that grow in after the bird molts will show signs of fading color.